I got back from the ANA summer seminar on Friday and I'm still trying to wind down, but tomorrow I will try to post on the event along with pictures of the dies the five people in the class made. Ya know Tom, I think you are right. I may try carving a patrix for hobbing dies. If it works, it could lead to some better die cutting jobs. 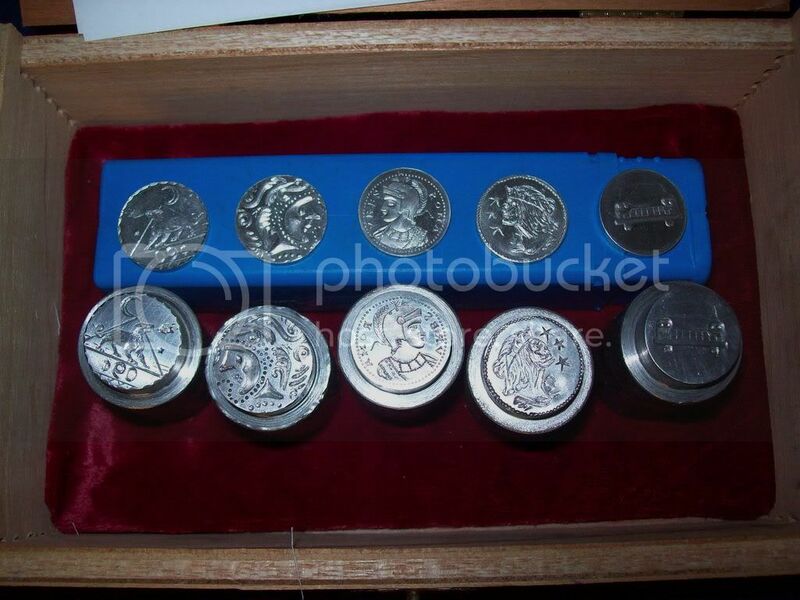 Below is a link to the picture of the dies and a strike from each of them. In the class we cut to size and mounted 5-6 gravers, laid out our designs ( I brought Transfer Magic and everyone was impressed with how it worked), and cut our dies. Mine is in the middle. Because the people from Gallery Mint couldn't make it this year to do our strikings, I brought my jig for hand-hammer striking. no one else wanted to hold the dies while swinging a 4 pound hammer, so I got to strike all 140 pieces we made, lucky me! Anyways, it was a great time and I would like to thank Steve Ellsworth for contacting Dave London for me. Dave brought his Lindsay PC to the class and let all of us play with it. I don't know if it will generate any sales, but there were some very impressed people in the class. Gotta go do that day job thing. My name is Bryan Bridges. 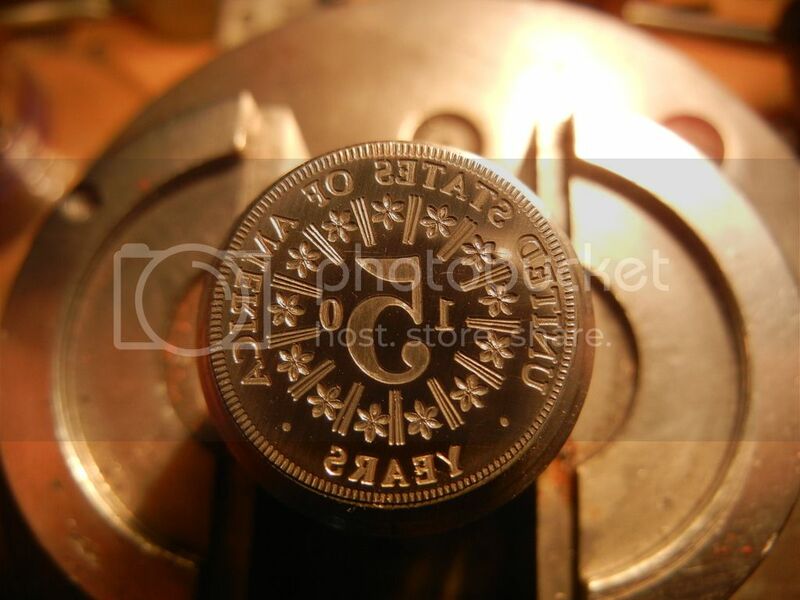 I am a die engraver, full time, for nearly fifty years. The major part of my work has been hand engraving,( with hammer and chisel) dies for coining and medallions. I have retired from engraving, but I do teach die engraving, along with most other types of engraving. My classes can be found on Steve Lindsay's web site. Perhaps I could be of some help to those of you who want to learn how to engrave dies and hubs. I think the rules say that you have to make a knife or sword now and then.....Please! You'll surely be an asset to this forum, Tom. All the best! I'm new to this site and engraving, so I can not offer any help or advise. I am really excited to see another local on the forum. Tom, I just came across this thread. It's fascinating. 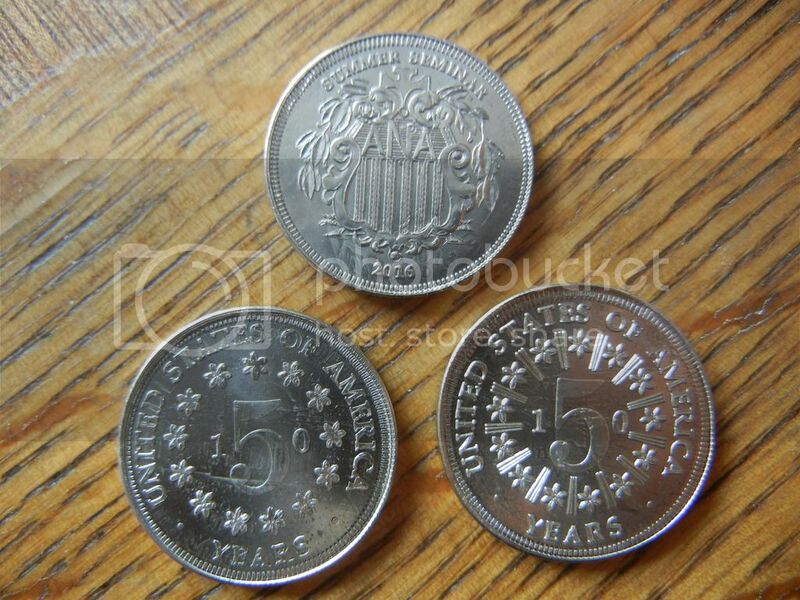 I love the idea of making fantasy coins. Thanks for taking time to do this tutorial. 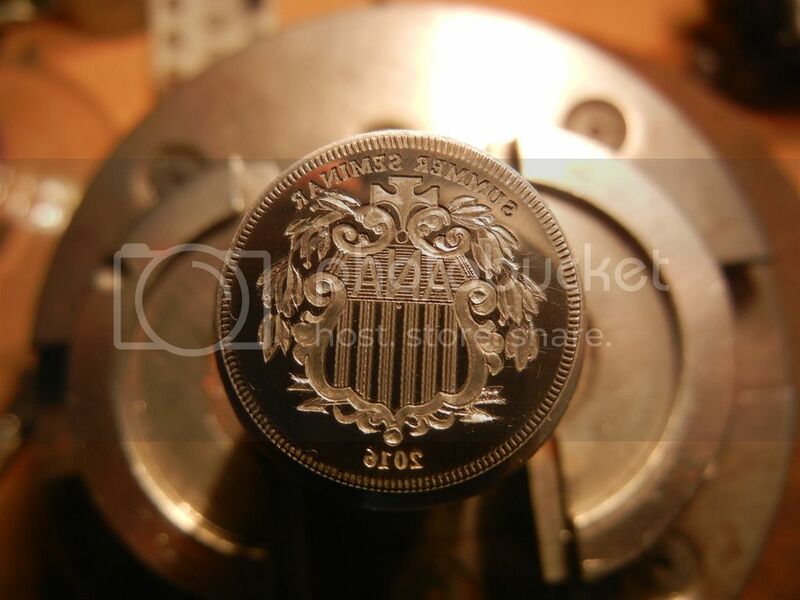 I just wanted to bump this thread back up and see if there is any more interest in the engraving of coining dies. My son Woody has become quite good at it, though untrained, and has developed some innovative techniques that are rather different, yet work out well for what we're doing. Here are a couple of our flipping coins that Woody did using his techniques... which involves the use of a Gorton 3d pantomill to get a basic relief depression, and then the use of a variety of punches with smooth or rounded shapes to push the metal around, rather than engraving it away in shavings. We are working in annealed W-1 tool steel... which is soft as butter. After the die in sunk then of course we heat-treat the dies before using them. 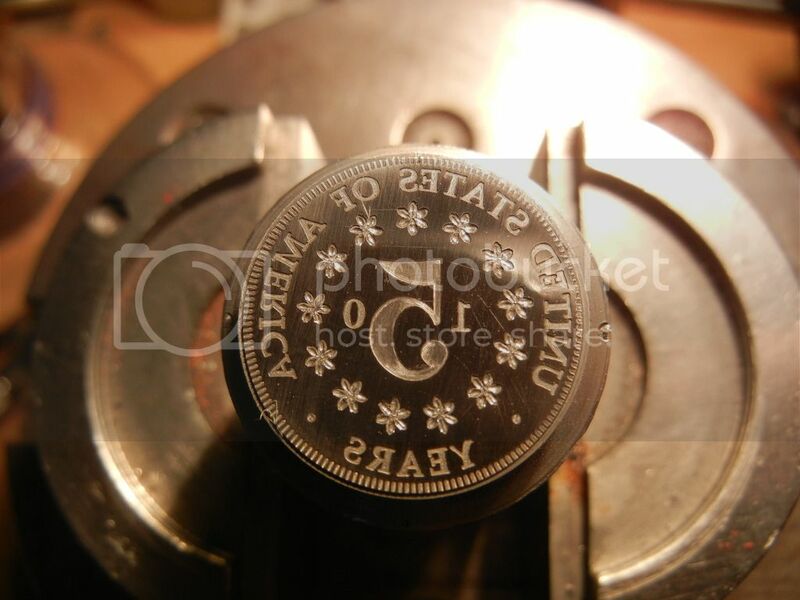 I have a Gorton GK-21 that I have used to engrave several small coining dies. I used O-1 for the small dies which are between 1/2 and 3/4 inch wide. For one, I made an epoxy cast of a Rapier Register Club badge from my LaGonda Rapier. I used a suitable pantograph ratio to have a tie tack sized finished product. I do not have a press, so I clamped the die against soft pure silver in my milling machine vise to get a good impression. I hand finished the pressings down to the outline of the impression. I did not make very many examples because of all the hand work involved. I can not post a photograph because we have recently moved and have not sorted out everything. I would very much like to have some sort of coining press, but the limitations imposed by advancing age may not permit such an acquisition. For the curious, the LaGonda Rapier was an attempt by LaGonda to offer a superior small car. They failed shortly after the Rapier's introduction, so very few were built. I know this is an old thread and in an earlier post you assumed that a lack of response also meant a lack of interest but I beg to differ. Die engraving is one of those areas in the larger field of engraving that holds some interest for me and because of this thread I also found a discussion you were having on another coining site. I have found both to be very instructive and entertaining. I spent much too short a time with Bryan Bridges in Tempe a few years ago and have since spent 6 months employed as an enameller with a badge maker who produced the dies for his products - this was my first experience of the larger scale presses that are required to produce these items. Unfortunately my time there ended and even though I offered to stay on with no wages in exchange for learning a bit more about the processes the offer was rejected. I have since aquired a couple of Taylor Hobson pantographs and have them almost in a condition to use. I have also arranged to get the steel for a 20 ton press (I am only considering pieces about 15mm in diameter for now) so things are starting to move. The next thing will be to find a space large enough to set all of these things up. Woody's die work is impressive. Using the pantograph for metal removal and then finishing up with punches is one of the ways Steve Adams showed me to make dies, although I found that I have better results with the slower cutting and scraping method. Attached are pics of three dies I just completed for the 150th anniversary of the nickel, and strikes over current nickels. Mostly mill work, just a little hand finishing work. Joe, That is a beautiful set of dies to commemorate the nickel's 150th! I too have a great interest in die engraving.